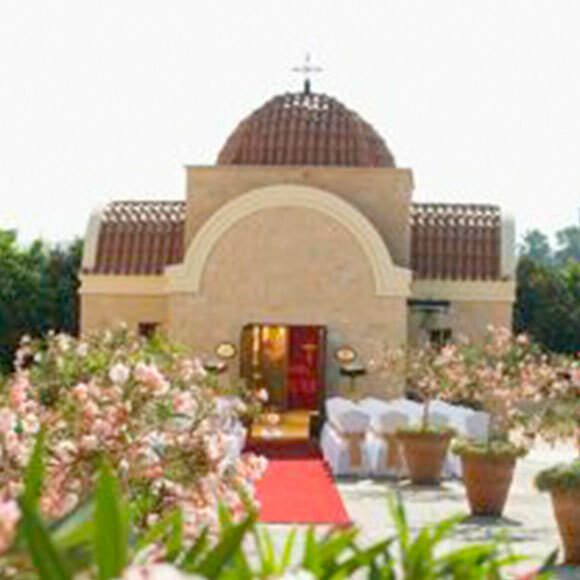 Introducing an exciting New Wedding Venue within a 15 minute drive from central Paphos! A collaboration of internationally-renowned experts has created an extraordinary resort that will captivate your senses! 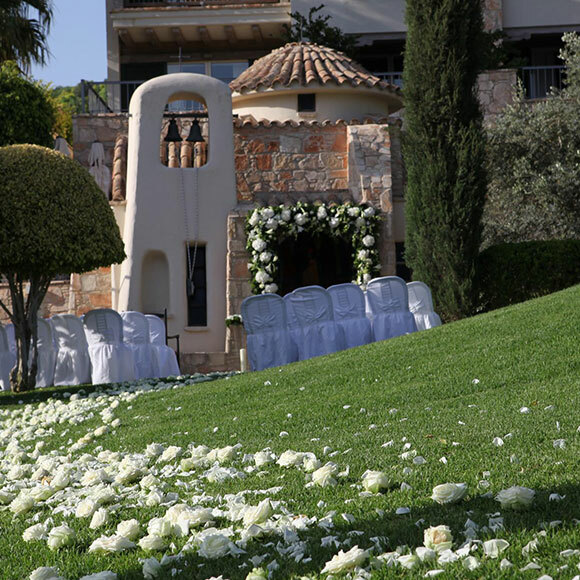 Combining the virtues of an exquisite design within the resort, mesmerising views and a true traditional Cypriot Monastery dating back to the 12th Century surrounded by vineyards and orchards this remarkable venue provides the perfect backdrop for your wedding day celebrations. Continue at the same location in the club house or your exclusive wedding reception. In settings designed to inspire this venue offers an array of dining experiences from a formal dining experience to casual alfresco dining. The resorts skilled culinary team has perfected the art of fusion cooking to create intriguing blends of flavour, colour and aroma by placing emphasis on locally sourced organic ingredients which only serves to enhance your wedding reception arrangements. Tucked in a valley, there are few places that can offer the same trtranquilitypanoramic views and sophistication that blends perfectly together to make an inspiring, historic, and truly romantic wedding venue! Equally attractive is the resorts policy of only one wedding per day! Yours! This is an extremely popular venue for both Anglican and Catholic Weddings ceremonies, with 100’s of weddings conducted each year so early booking is essential in order to secure your chosen date. This beautiful chapel has stunning decorative frescoes covering the entire inside of the chapel. It is situated in an elevated position overlooking the coast next to St George’s Hotel in Chloraka and can hold up to 30 seated guests although if your group is larger some guests may stand too. Catholic services are held on Monday and Tuesday of each week, and Anglican services on Wednesday, Thursday and Friday of each week. 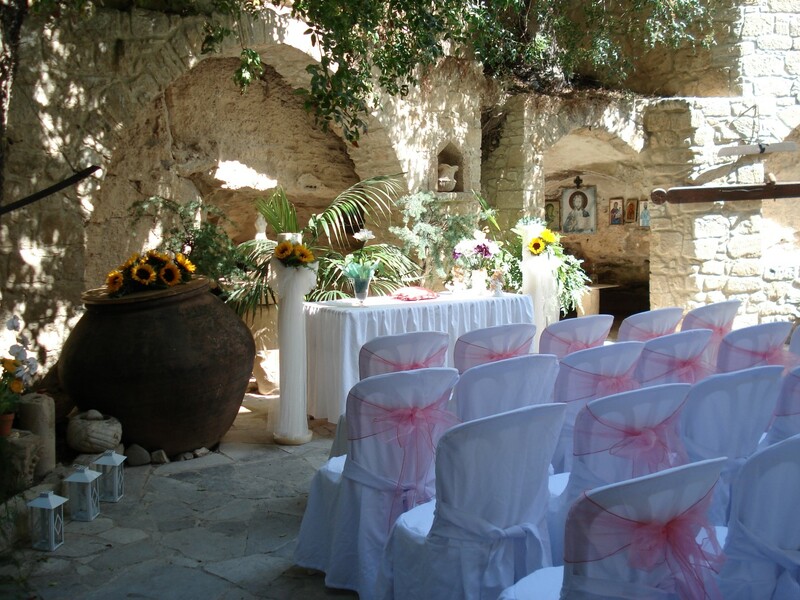 This Byzantine style church was built around the 13th century and is a very popular venue for both Anglican and Catholic ceremonies for weddings in Cyprus. 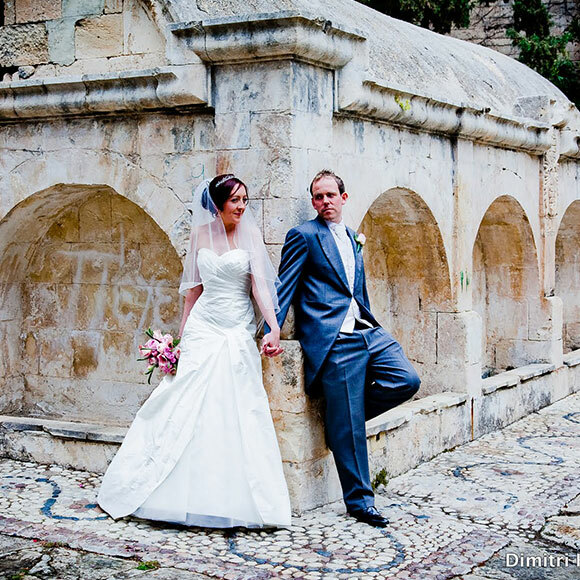 The church is surrounded by the ancient ruins and mosaics of previous churches and offers a stunning setting for the wedding photographs. The church can hold up to one hundred guests so is ideal for the bigger weddings. Anglican services are held on Monday & Tuesday, and Catholic services on Wednesday, Thursday and Friday of each week. This church offers a perfect backdrop for stunning wedding photographs. 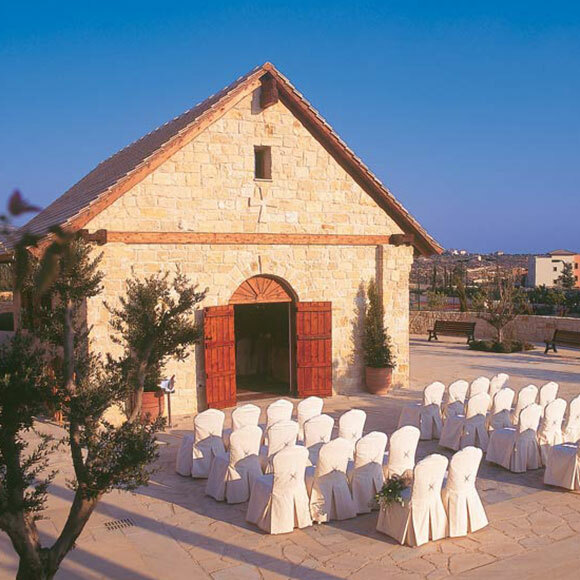 A number of beachside hotels to hold your wedding in Cyprus but many of the Paphos hotels have attractive private chapels or outside gazebos on their grounds where you can arrange to have either a religious or civil wedding ceremony. A large number of local hotels are licensed to host civil wedding ceremonies, and in some cases religious ceremonies which are carried out at the discretion of the church. 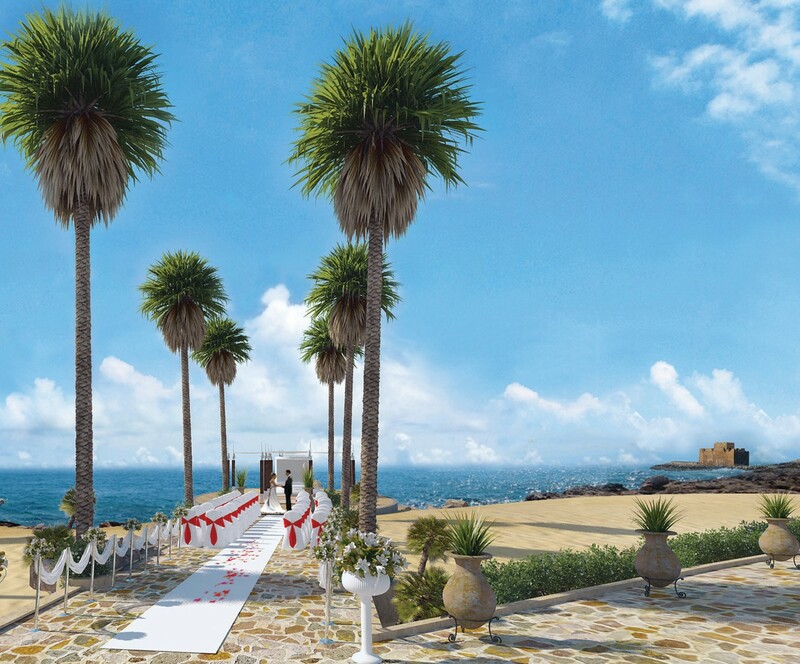 Most of the hotels have beautiful beachside gardens in which the ceremony can take place, and most provide special locations, pergolas and gazebos for the actual wedding ceremony itself. If you also choose to have your wedding reception at a hotel, then each hotel generally has a selection of attractive indoor and outdoor locations for wedding parties of varying sizes. 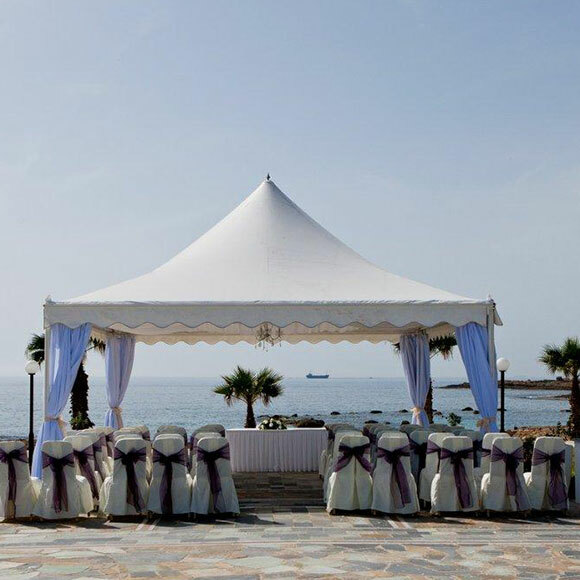 Elegantly presented Wedding Gazebo for the Bride & Groom to exchange vows at a stunning beach location. For your own personal reasons, a civil ceremony may suit you best. Paphos municipality is situated in the heart of Paphos old town making it a 10-15 minute drive from most hotels in Paphos, furthermore the architectural stature of the building is quite beautiful! This is in addition to the pride that is taken by the municipality for the up keep of the town hall and surrounding gardens making it an excellent location for photo opportunities. With Weddings in Cyprus the ceremony is read in English and is a relatively short service lasting approximately 8-10 minutes. However it has to be said that this does not by any means take away the importance of the day. 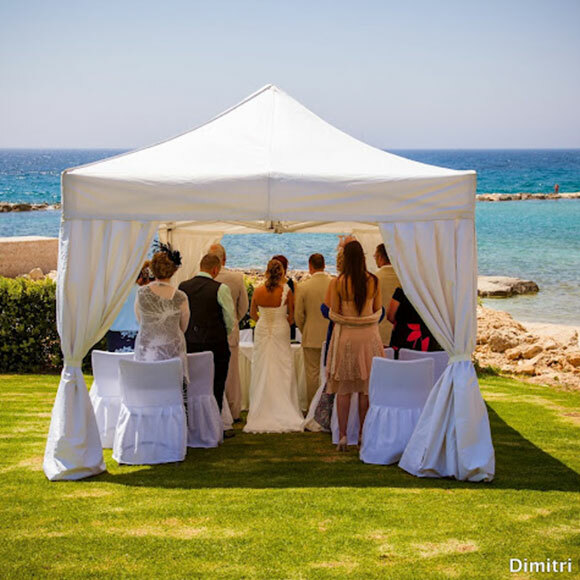 There are various reasons why couples choose a civil ceremony for weddings in Cyprus. Maybe your religious beliefs are different to those of your partner or maybe quite simply you “just want to be married”. Peyia Town Hall is situated in the hills of Peyia Village. It’s quaint and small, and the wedding ceremony is traditionally held outdoors, beneath a gazebo. 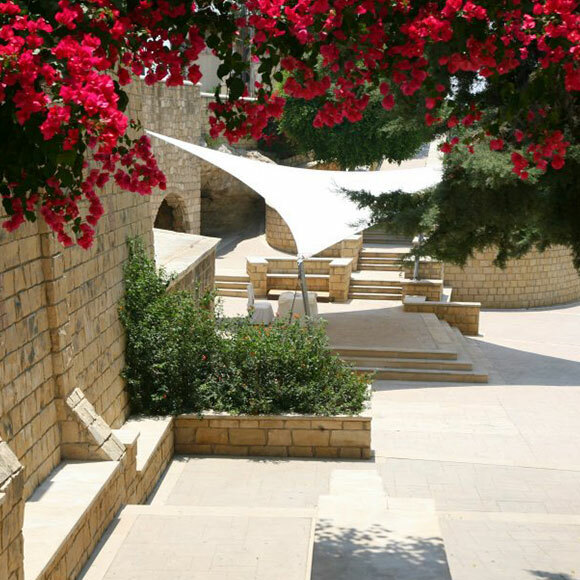 Here you can have an indoor wedding (air-conditioned) or an outdoor wedding in the beautiful gardens. Lovely setting for photographs. 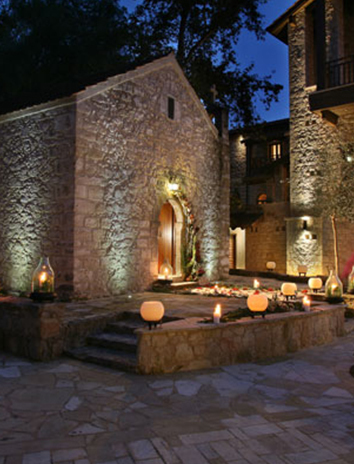 Geroskipou Village is only a 10 minute drive from Paphos Tourist area which is where most of the Hotels are situated. This is a beautiful location to marry, The ceremony will be conducted by the actual Mayor of Geroskipou under the sail canopy in the grounds of the old village water wells. 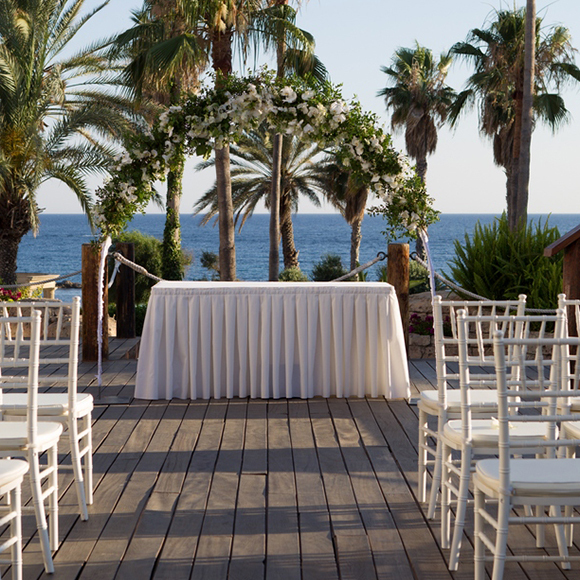 Zaffron weddings offer many stunning Paphos hotel locations to choose from all with amazing sea-views. The hotel require that you are resident for a minimum of 2 nights when having your ceremony at the hotel plus compulsory wedding reception meal held at the hotel. 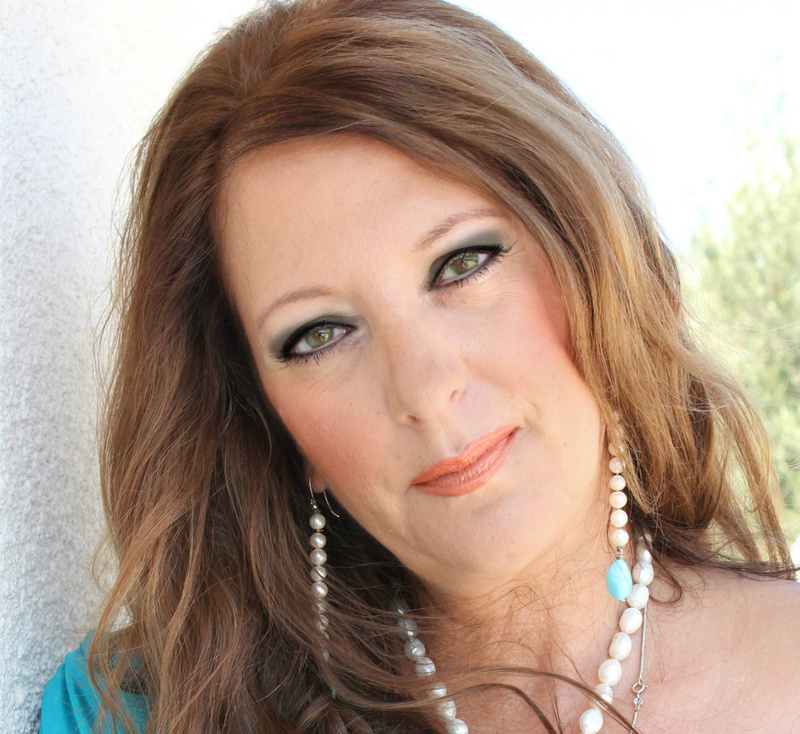 They will also require that you have your wedding reception to follow at the hotel. Villa weddings are becoming increasingly popular – You can chose to have a low key or extravagant affair and this is the beauty of a villa wedding. This is an ideal alternative for those that want to hire a villa for the duration of their wedding stay here in Paphos. Having your wedding ceremony and/or your wedding reception in a beautiful villa means that you will have privacy and choices with no time restraints governed by hotels and other venues. Our expertise lies in creating a unique and fully customized wedding at the villa of your choice and if you require we can personally help you find a suitable villa for the occasion. We have the right mix of energy, patience, creativity and knowledge to make your wedding everything your dreamed it would be. The Ethnographical museum is now able to offer this venue for receptions as well as ceremonies. Something totally different and unique. This is available to the guests for an hour and a half; drinks and canapes are also available on request. A stunning private venue for your ceremony offering alternative photo opportunities. Private chartered Yacht and luxury boats are available for parties from 10 up to 150. Champagne and canapes can be arranged on arrival with free wine and soft drinks throughout . Exquisite sunsets, cool breezes and a stunning coastlines – a most romantic place to have your civil ceremony and exchange vows. This location offers a stunning views and an amazing back-drop of the Mediterranean and 1st class service and food. Why not say ‘I do’ in style. You can have your own private chef cooking delicious food at your wedding reception in this unique boutique hotel. We can now offer a setting that can provide the opportunity of total privacy, whether as a ceremony and reception venue combined or as a reception venue only it guarantees to arrange one wedding per day. 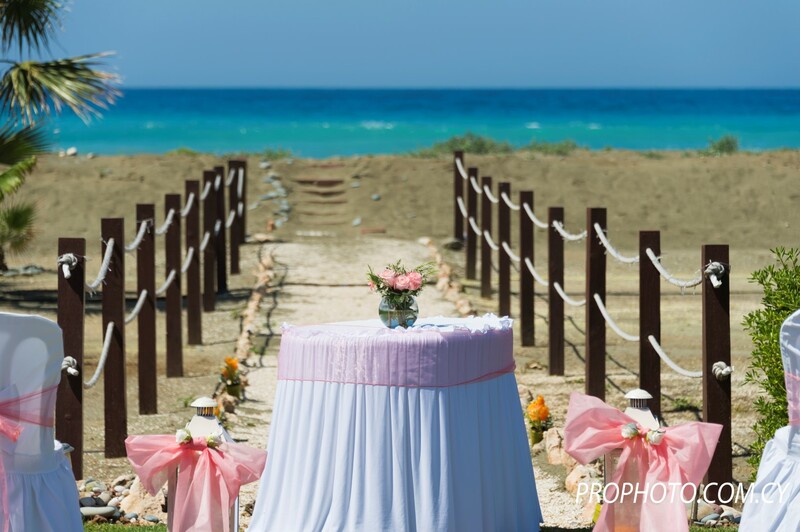 Approximately a 10 minute drive out of central Paphos this venue offers views as far as the eye can see. Along with a first rate service and a wow factor feel within a relaxed atmosphere this venue is a favorite amongst those who require to share their special day only amongst loved ones. It offers both indoor and outdoor facilities for a reception meal where a private DJ can freely entertain without any restrictions adding to the celebrations of your day. Whether you prefer a private room for your meal adjacent to a terrace with exceptional views or choose to have your reception meal outdoors this venue has what it takes to impress and relax just amongst your family and friends. 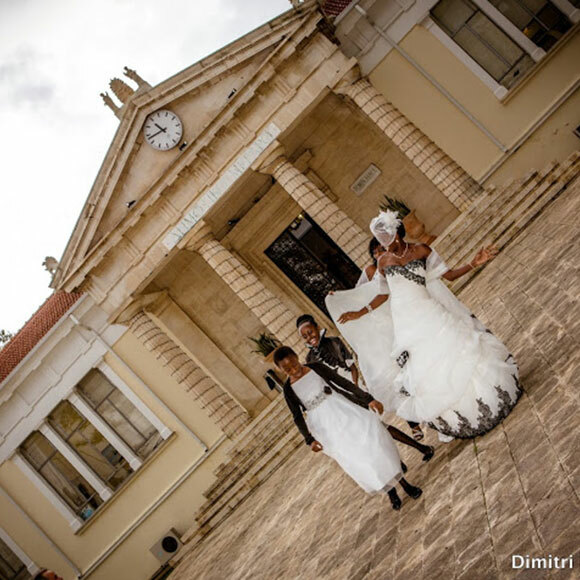 We can now offer a new and exceptional wedding venue: the OTTOMAN BATHS that lie within the historical center of the town of Pafos. Found near the old market place, the Ottoman (Turkish) baths provide an ideal choice for those who seek to celebrate their wedding in an environment that combines the old and new with perfect harmony. The Ottoman Baths operate today as a Municipal Cultural Center and a marvelous outdoor area has been landscaped to meet the needs for an exclusive wedding ceremony. For those who seek the privacy and the ‘mystery’ of this historic site, their civil wedding ceremony can also be conducted inside the Baths. 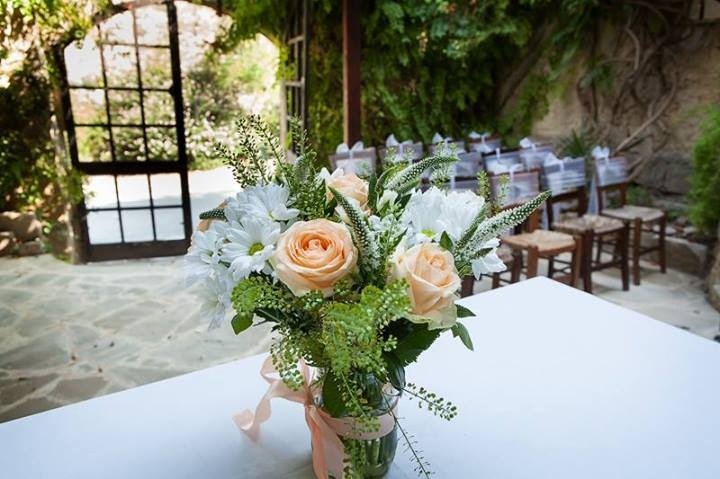 This charming family run rustic venue set in the country-side only half an hour drive from Paphos town, is perfect for those who prefer to go Greek Style. At this particular hotel venue you can immerse yourself in local Cypriot charm; stunning mountain backdrops, our vine covered terrace, delicious menus with a traditional influence and local drinks.